Today when I came in office I saw an email from my boss. He was asked by one the bussiness heads that why the week numbers in outlook would show one week ahead? Week number according to the ISO-8601 standard, weeks starting on Monday. The first week of the year is the week that contains that year’s first Thursday. The highest week number in a year is either 52 or 53 and outlook is fully compliant to this specification. 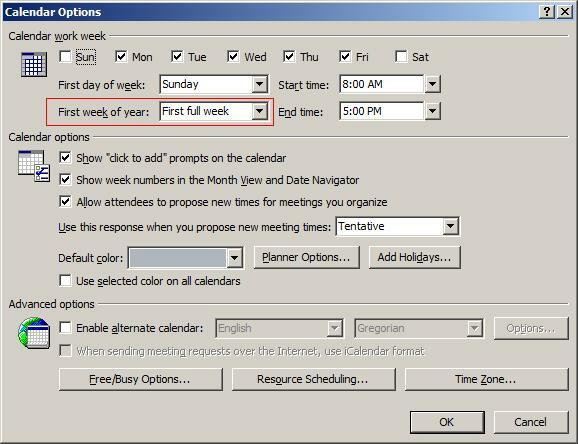 Normally, when we configure the outlook profile we do not pay much attention to a very small calendar setting which actually manages all this week number related stuff. Its pretty simple to configure. In common situations the calendar is configured to use the 1 Jan of the year as the first week of the year. Which results in this mismatch of outlook calendar numbering. This entry was posted on 05/03/2010 at 10:32 AM	and is filed under Exchange 2003, Exchange 2007, Outlook. You can follow any responses to this entry through the RSS 2.0 feed. Both comments and pings are currently closed.